On the edge of Bogota’s central plaza there are a row of tents covered by black tarps. This is where coal miners from Colombia’s Norte de Santander region have been striking in Bogota’s main plaza, Simon Bolivar, for nearly a month. The men are protesting the failure of the state to provide them with compensation for accidents on the job. Spokesperson for the strikers, Farley Rodriguez Ramirez, told me on Monday that when he went to the Administration for Work Risks in Bogota to seek help, he was treated violently and did not receive services. “The police even stole my phone,” said Rodriguez. Some of the miners have received treatment. One miner pulled up his shirt and showed me a long scar that ran down his spine, showing where he had received a surgery that corrected a work injury. But the miners claim that the surgery was poorly done, and the miner will not be able to return to work. 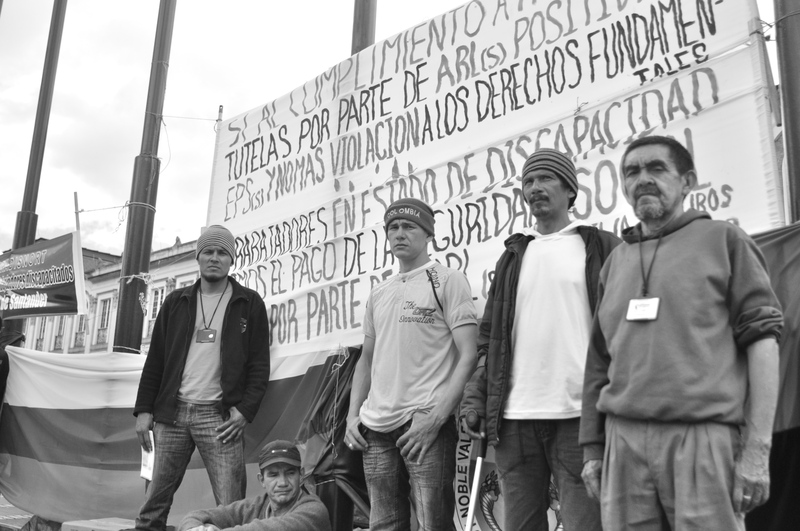 On August 19th, coffee farmers, truck drivers and miners across Colombia executed strikes in an effort to press the Santos administration for more attention to what many workers believe are broken institutions behind big government promises for reform. Coffee farmers, who negotiated funds to help subsidize their falling incomes, understand that the funds the government promised have enough money. But they claim they cannot access them. A study published by Bogota-based think tank ANIF found that Colombia’s strikes cost the country’s economy around $470 million.